April 10th was officially adopted by the Gopher Tortoise Council as Gopher Tortoise Day! In Florida, gopher tortoises are found in parts of all 67 counties and are frequently encountered in neighborhoods, along roadways, and in many of Florida’s public parks and forests. The goal of Gopher Tortoise Day is to increase awareness and appreciation for these long lived, gentle reptiles. Gopher tortoises are considered a keystone species because they dig burrows that provide shelter for 360 other species of wildlife, called “commensals.” These commensal species include the gopher frog, Florida mouse, eastern indigo snake, and hundreds of invertebrates like beetles and crickets. 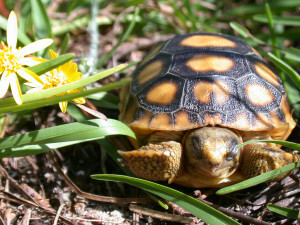 Without the gopher tortoise, many of these species would not exist. You can help celebrate Florida’s only native tortoise by hosting an event in your community, asking your local City or County Commission to officially adopt April 10 as Gopher Tortoise Day, and by educating others on the importance of protecting gopher tortoises. Use the menu above to access resources, including the resolution template, ideas for hosting your own event along with hands-on activities, and educational materials that can be printed and distributed to friends and neighbors in your community. Learn more about the gopher tortoise by visiting MyFWC.com/GopherTortoise or GopherTortoiseCouncil.org.